If you’re looking for some flat ivory wedding shoes with a touch of glamour, then Pink by Paradox could have something for you. 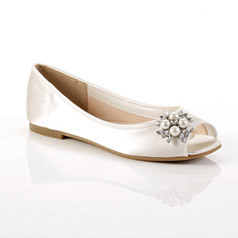 These are beautiful flat peep toe style wedding shoes made from high quality ivory satin. 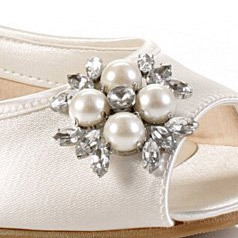 Each shoe is adorned with a stunning brooch which adds a bit of sparkle to these shoes. The vintage looking brooch is decorated with 4 magnificent pearls which are surrounded by diamantes. The combination of pearls and diamantes creates a striking flower which can be seen above. Pink by Paradox are well known in the world of designer wedding shoes and are renowned for creating fashionable pieces that are comfortable to wear. It is no suprise that reviews have said that these shoes are nicely padded and comfortable to wear. These satin bridal shoes are available in sizes 3 to 10. This extensive choice of sizing makes them a good shoe for bridesmaids, as there is flexibility to fit different age groups. Flower Wedding Shoes are available to buy for under £60 too.